RENO, NV -- (Marketwired) -- 12/03/13 -- New Q3 data from Synergy Research Group shows that Cisco held on to leadership of UC collaboration with a 24% market share, while Microsoft, which has been inexorably closing the gap on Cisco, dropped off the pace a little in Q3 with its share slipping to 19%. Avaya reversed a trend of market share decline by boosting UC application and telephony sales, a sign that it remains a strong competitor. 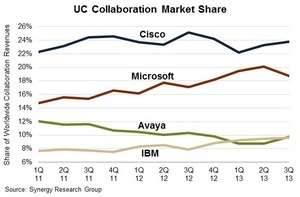 Worldwide revenue from UC collaboration -- which includes enterprise voice systems, UC applications, telepresence, collaborative workspace software, email software and enterprise social networks -- reached $5.7 billion in the quarter, marginally up on Q3 of last year. 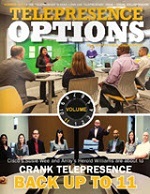 Revenues from enterprise voice and telepresence continued to soften due to a combination of factors, including a growing shift to software-based pricing, strong competition amongst vendors and competition from disruptive technologies such as cloud UC. The quarter saw particularly strong growth in email software and enterprise social networks, while on a rolling annualized basis collaborative workspace software has seen the strongest revenue growth -- a segment in which Microsoft enjoys a 47% market share. "In the premise equipment market we continue to see a strong transition in spending away from legacy technologies and towards software-based collaborative applications," said Synergy Research Group's founder and Chief Analyst, Jeremy Duke. "Microsoft and other vendors that are transitioning to a software pricing model are benefiting from this spending shift and we anticipate that this change will continue to have a positive impact on future revenues. Notwithstanding the temporary blip in Q3, Microsoft continues to gain share in UC collaboration and is closing the gap on market leader Cisco." Synergy provides quarterly market sizing and segmentation data on enterprise voice, UC applications, telepresence, collaboration technology and related markets, including vendor revenues by segment and by region. Data is provided via Synergy's uniquely flexible SIA database which enables rapid analysis and provides a range of graphic data presentation options. To speak to an analyst or to find out more about how to access Synergy's colocation market data, please contact Heather Gallo @ [email protected] or at 775-852-3330 extension 101. RENO, NV -- (Marketwired) -- 12/03/13 -- New Q3 data from Synergy Research Group shows that Cisco held on to leadership of UC collaboration with a 24% market share, while Microsoft, which has been inexorably closing the gap on Cisco, dropped off the pace a little in Q3 with its share slipping to 19%. Avaya reversed a trend of market share decline by boosting UC application and telephony sales, a sign that it remains a strong competitor. 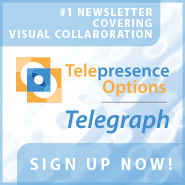 Worldwide revenue from UC collaboration -- which includes enterprise voice systems, UC applications, telepresence, collaborative workspace software, email software and enterprise social networks -- reached \$5.7 billion in the quarter, marginally up on Q3 of last year. \"In the premise equipment market we continue to see a strong transition in spending away from legacy technologies and towards software-based collaborative applications,\" said Synergy Research Group's founder and Chief Analyst, Jeremy Duke. \"Microsoft and other vendors that are transitioning to a software pricing model are benefiting from this spending shift and we anticipate that this change will continue to have a positive impact on future revenues. Notwithstanding the temporary blip in Q3, Microsoft continues to gain share in UC collaboration and is closing the gap on market leader Cisco.\"